The foot is the least understood of all moving body parts because of the complex interworking?between its many joints, tendons, nerves and more. What we do know is that the foot is perfectly built for its two most important functions: (1) absorbing shock and (2) propulsion. These functions are first controlled by the brain and spinal cord that receive messages from thousands of nerve endings on sole of the foot. Nerves relay vital information about the ground terrain so the body can react accordingly. When the foot’s sensing system is synchronized with its moving hardware the foot becomes an unbeatable, self-sufficient and adaptable machine. It is tendons that are most crucial for movement because they provide such a high amount of energy for their size, the kind of energy that can be seen by the stretching and snapping of a rubberband. The four major tendons originate below the knee and string all the way down to the foot. 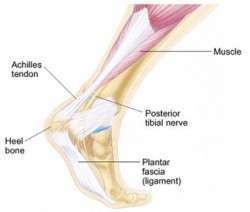 The later two tendons string down along the inward side of the ankle bone, wrap under the arch, and attach at the very tips of the toes. The foot’s two main mechanical functions are (1) absorbing shock and (2) propulsion. At the point of ground touchdown the foot acts as a shock absorber, soft and flexible, and then in preparation for push-off the foot turns into a rigid lever. To help us further understand the workings of these functions, we use a model called the Windlass Mechanism developed in 1954 and is now commonly used in various mechanical engineering applications. The foot uses the Windlass Mechanism upon landing and at push-off. 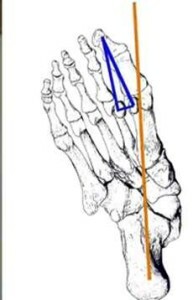 The arch of the foot can imagined as a triangle. 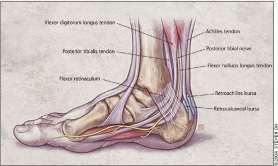 The bottom of the triangle is the all important plantar fascia ligament that serves as a high tension cable. When the toes are lifted the plantar fascia wraps around the metatarsal bones tightening its tension which lifts the foot’s arch higher and higher. The further the toes are flexed back the higher the arch rises. 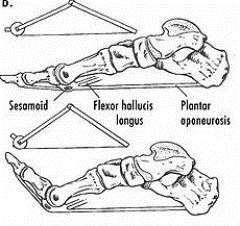 The raising and flattening of the arch is maybe the most important mechanism of the foot. Since the height of arch is controlled by flexing the toes, the toes play a critical role in both absorbing shock and propulsion. During the stride cycle as the foot comes down for a landing the toes are?flexed up so that the foot lands with the arch high like a shock absorber at full extension. Then as the body bears weight on the foot, the toes lower and the arch flattens dissipating shock in a controlled manner. Into the next phase of the stride the body moves forward and the heel lifts up which again flexes the toes up lifting the arch and turning it into a rigid lever. The rigid lever makes for an energy efficient and rapid push-off. Therefore, according to the Windlass Mechanism free movement of the toes and plantar fascia ligament are critical for proper shock absorption and propulsion. The foot has evolved to be an incredibly advanced system for movement. When in its natural state (without shoes) the foot moves in the most efficient and healthy way. It rolls, stretches, expands, and grasps the ground. The foot is so self-sufficient that it only works properly without shoes. Therefore, nothing worn on the foot can improve the foot’s functions but only hinder them. For example the foot has its own built in system for absorbing shock: see the picture of the Foot’s Natural Suspension System to the right. NO arch support: foot’s arch needs to?flatten on impact?to dissipate shock. NO heel cushioning: heel needs to be flat & level in order to stretch achilles tendon. NO stability or motion control: foot uses pronation, rolling inward, to deflect shock. NO cramped toe box: toes splay apart upon contact softening the landing. The foot is the model for an ideal shock absorber. Most shock absorbers work in one direction; the foot functions in three. The Windlass Mechanism explains the vertical movement of the arch, but it doesn’t explain the other directional planes. Pronation happens in a tilting direction and in the lateral direction the transverse arch flattens and toes splay apart. Pronation as a term has gotten a bad rap from the running shoe industry, however, it may be the most critical of all foot functions. Pronation is the natural motion of the foot rolling or tilting inward in order to dissipate shock. It occurs at different degrees and is best seen when running or landing from a jump. he foot lands on the outside border with the ankles turned inverted. s body weight settles down on the foot, the ankles roll inward and the foot rolls inward flattening out.? Pronation cannot occur with arch support, especially the support of rigid orthotics. Support simply blocks the foot from rolling inward which causes the impact force to go up the body instead of being dissipated. The ball of the foot is made of five very mobile metatarsal bones. 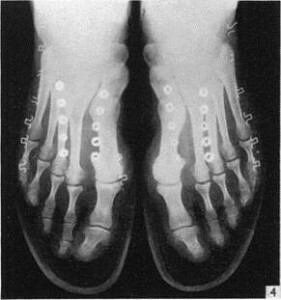 An arch spans across thes metatarsals known as the transverse arch. The foot naturally rolls across the ball of the foot starting at the outside and rolling inward to the big toe. 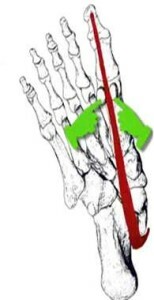 To initiate the roll the foot touches down on the outside at the 5th metatarsal. This 5th metatarsal is very mobile and displaces easily away from the other four metatarsals making for a soft touchdown. At this point the transverse arch begins to flatten just like a leaf spring suspension system. This flattening widens the ball of the foot by about 15%. Rarely when fitted for a shoe do you account for the extent to which the foot widens. Which is why a “snug fit” can easily result in a stress fracture of a metatarsal bone. As the five metatarsals widen upon bearing-weight, the five toes splay apart. They must spread even further apart than the metatarsals, with open space between each toe. The toes are responsible for forming a stable, wide base for the upright body. A second function of the toes is sensory proprioception. Upon touching down the toes spread across the ground so they can relay critical information to the brain, describing the level of landing surface and how the body will have to adjust. Contrary to popular belief, the toes are the widest part of the foot, not the ball of the foot. 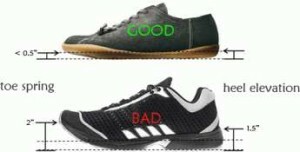 Unfortunately, since fashion dictates shoe design instead of foot biomechanics, shoes are designed with tapered toeboxes, narrower than the ball of the foot. Cushioning blocks feeling of the ground causing loss of nerve sensation. Support immobilizes the foot causing muscle atrophy. Support leads to a dependency. 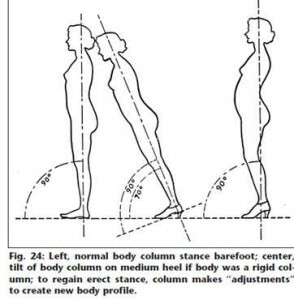 Even slightly elevated heels throw posture out of alignment. The great toe is critical for a functional gait and normal arch functioning. Remember an arch is supported by its ends- this is the big toe on the front end and a heel flat and balanced with the forefoot on the other end. When the big toe is not aligned you are left with a foot that is very unstable, with no ability to absorb shock, and with limited to no propulsive properties. The big toe must be properly aligned for the muscles and tendons to do their normal stabilizing functions. You can feel this yourself if you stand on one foot and try to balance…you feel the big toe activated and gripping the ground. Millions of women and men have a misalignment of their great toe called hallux valgus, a condition caused by improper footwear with a pointed toebox which pinches the big toe into this position. It is very difficult corrected surgically or with traditional orthotics. One product called Correct Toes will position the toes back into their normal anatomic position to help restore the stabilizing and shock absorbing functions of the toes and foot. My own short experience with this product has been a profound new discovery. I am a marathon runner still running at the national level as a Master. I had surgery for severe arthritis in my large toes 12 years ago. This left me with a valgus deformity. With Correct Toes I immediately felt benefit in stride efficiency when the big toe was perfectly aligned. I felt my foot was the magic spring it was when I was a child running effortlessly on the beach. Heel Elevation: Mistakenly, almost every shoe available today has some sort of heel height, this is especially harmful in athletic shoes. Toe Spring: (sole curvature upwards) From the ball of the foot to the toes shoes curve upwards, incorrectly lifting the toes off the ground. Tapered Toebox: (narrow toe area) Nearly every shoe narrows from the ball of the foot to the toes (symmetrically), however the shape of the foot is widest at the toes and off center from the big toe. Curved Last: (i.e. “crooked” last) The midfoot area of the sole is cutout denying use of the 5th metatarsal ray, which is naturally a weight-bearing bone. Elevated heels create a “domino effect” of bones. MYTH: Cushioning in a shoe absorbs shock. Myth Busted: Cushioning underneath the foot increases the force that you step down with. Every time the foot steps down the body tries to find its stability and so with softer material under the foot you subconsciously attempt to step through the shoe to get to a harder my stable surface. Also, cushioning blocks feeling of the type of surface beneath your feet. With cushioning the 200,000 nerve endings on the sole of the foot send false information to the brain because of the confusion for what’s actually under the foot, “is it hard or soft?”, “flat or uneven?”. The other thing about cushioning is that it’s typically combined with arch support and a snug fitting shoe, which together rob the body of its natural suspension system. Myth Busted: First of all, the surfaces of today are no harder than the in the past. Some civilizations lived mainly on rocky terrain that was so uneven there wasn’t a flat enough spot to set up a bed. More importantly, the body adjusts accordingly to the hardness of the ground by landing with more knee flexion and more foot pronation. However, the more inhibiting the shoe, the less the body senses the hardness of the ground. Barefoot runners of today consider pavement one of the easiest surfaces to run on, because it’s so smooth and consistent. When you go off the road is when it gets tough. MYTH: Feet are fragile and need protection. Myth Busted: Contrary to common belief, your feet are not fragile. Most likely, they have been in shoes your entire life and you have just never given your feet a fair chance. Most of us wear flip-flops in the summer and you may have noticed by the end of the summer your feet are stronger and built-up. The feet are amazing in that they adapt to whatever you wear or don’t wear on your feet. The skin on the sole of your feet is the fastest at regenerating of all the skin on your body. This skin is 6 times stronger than all other skin tissue. Your muscles, tendons, ligaments, and bones are just as incredible at recovering and building up a tolerance. Protection in shoe design has gotten so overdone. Now we have toe bumpers, so we can carelessly go about bashing our toes. We have stiff plates in our soles, so we can mindlessly stomp our feet through the ground. And we have support and cushioning to insulate us from the world around us. MYTH: Repetitive stress activities weaken the arch over time. Myth Busted: First of all “repetitive stress” is a misleading term because what health practitioners usually mean when they use this term is “high impact exercise,” which makes up nearly all exercise. Exercise is the best thing you can do for your body. When you apply repetitive stress to any part of the body, it does fatigue but only for a short time and then it BUILDS BACK STRONGER. The arch of the foot is no exception. So when the arch is naturally exposed to repetitive stress it will get stronger which raises the arch so that next time it can better handle more repetitive stress. This is yet another case that we see the foot is a more adaptable machine than we ever thought. Myth Busted: In fact the opposite may be true. There has never been a single well-done study to support the theory that more shoe is better. Strong evidence shows that thickly cushioned running shoes have done nothing to prevent injury in the 30-odd years since Nike founder Bill Bowerman invented them. Myth Busted: As described in our section on foot mechanics, pronation is a natural and functional movement. Overpronation is not when it is combined with weaknesses in the knee and hip…causing the runner to lose good alignment. To see extreme pronation that is completely functional watch this video of marathon world record holder Haile Gebresalasie. His foot is pronating and acting like a spring, but his core is aligned and solid. Strengthen your foot and support structure and you will run more like Geb in function, even if not in speed. If you are weak in the hips and feet- you will pronate and deform your knee angle. Watch the girl in the video, she is pronating and her knees are “kissing”. MYTH: Children need a “good” shoe for healthy foot development. Myth Busted: As Dr. Lieberman demonstrated so well in his landmark paper in Nature, footwear can influence natural gait. See Dr Lieberman’s amazing site of research. Next time you are in a park, watch a child run barefoot. Notice the relaxed movement and foot placement. They lean slightly forward and their legs fall out behind them. They do not strike hard on their heels. Then watch the child with the highly cushioned or supportive shoe. The difference is easy to see. Anything on a child’s feet should support natural neuromuscular development . Thin soles, allowing proper proprioception, neuromuscular activation in the entire kinetic chain, and complement the body’s natural ability to absorb ground forces. Low, flat to the ground profile- designed for all play activity that involves climbing, running, and jumping. Enhance lateral movement and not place the foot on a platform or have a slope from heel to forefoot. The materials should be soft and supple- allowing natural foot function. The toebox must be wide enough to allow natural toe spread. A single piece midsole/outsole allowing protection on unnatural surfaces (concrete, asphalt) and natural rough surfaces (rock,trail) while allowing proprioception and natural foot motion. A child does not need “traction” to grip. Their foot does that. Upper material should be soft, breathable, and washable. Yes, throw your child’s shoes in the washing machine, consider a presoak with dilute bleach, and air dry. This will reduce bacteria. Shoes should not be fit with thick, heavy socks- as these interfere with foot proprioception. Myth Busted: Watch any international marathon with world class African and Japanese runners and this is proof in itself. The best wear what is essentially a slipper on their feet. Enough shoe to protect them from the urban streets of New York City, Chicago, Berlin, or other major cities that host the events. The marathon world record was run in Adidas Adizero by Haile Gebresalasie. (See video of amazing efficient running form) . This is one of the lightest shoes on the market. It has slight heel elevation, but for Geb he is going so fast and is so far forward …he is essentially running on the balls of his feet, settling down his heel, and springing for the full 26 miles with incredible elastic recoil of his Achilles and foot. See USATF Coaching Article #168 – a must-read. Myth Busted: Again, the opposite is true here. Having a snug fit is like having a corset for your feet. Tight lacing and snugness prevents the natural spread of the transverse arch on landing and the longitudinal arch on functional pronation. These two functions are critical for shock absorption. Snugness in the toe box prevents the natural spread of the toes, neglecting them of their function in propulsion and stability. MYTH: I have heel pain so I need cushioning. Myth Busted: One of the main causes of plantar fasciitis is elevation of the heel with a more cushioned midsole. When the heel elevates the plantar fascia and Achilles shorten and becomes susceptible to injury when stressed with running activity which tends to stretch them out and stress them. Another negative effect of a cushioned elevated heel is the loss of the involuntary stretch reflex of the Achilles and posterior lower leg muscles. This stretch reflex is designed to aid the forefoot with propulsion, yet it can only be activated if the heel comes close to the ground. The elevated heels and softness of most available footwear, including athletic shoes, prevent this stretch reflex from occurring. The foot muscles and plantar fascia must activate more to make up for the loss of this stretch reflex and softer midsole materials. MYTH: I need arch support for standing on hard surfaces all day. Myth Busted: An arch is a structure that is able to support weight over an open space, by providing support on either end of that open space. This applies to the arch of the foot too where we must support on either end of the arch with proper position and function. This is exactly the opposite of the type of “arch support” that is available to consumers, either over the counter (Dr. Scholl’s for example) or from healthcare professionals (rigid orthotics). These products attempt to “support” the arch, not by supporting the ends of the foot arch, but rather by lifting up under the open space of the foot arch. Individuals who grow up barefoot have natural foot strength and support, and this is likely part of the reason why their foot arches function perfectly throughout their lifetimes. Their feet do not break down, unlike 80% of Americans who by nature of their habitual shoe wearing and compromised arches, will suffer some form of foot problem at some point in their lives. Reducing traditional arch support with proper strengthening should be a process, not an event. MYTH: Average life expectancy has increased, shoes are necessary to preserve the life of our feet. Myth busted: Cultures that run and walk their whole lives in flat functional footwear (or barefoot) do not have the problems that habitual wearers of elevated heel shoes have through time. Fallen (or failing) arches rarely if ever occur in the Tarahumara Indians, Asian farmers and rickshaw walkers, and farmers in Costa Rica, Sardinia, and Icaria- the longest living places on the planet and places where most of the day is spent on ones two feet. More importantly is that in these cultures osteoarthritis of the hips, knees, and back is extremely uncommon, perhaps another attribute to the benefits of the proper postural alignment from being flat to the ground. No article on the transition to minimalism is complete without some discussion on the effect of footwear, what is the ideal for footwear, how do you choose what is best for you, and most importantly how to fit the shoe. A proper fit accounts for the natural expansion of the foot upon ground contact. Excess waste is eliminated, along with everything that inhibits your foot’s natural motion. So your foot is free to move and work the way nature intended it to; the way of its own barefoot motion. Toe wiggle freedom. First, abandon the notion that you have a shoe size. Instead you have a foot size. Shoes are made all over the world and apply different shapes and standards. If you measure your foot seated with a traditional measuring device like a Brannock Device and base your size on that you will likely be off by 1-2 sizes when applied to a running or hiking shoe. One shoe size is only 1/3 an inch. Also critically important is that the Bannock device measures the widest part of the shoe at the ball. Infant feet and the feet of unshod societies are widest at the ends of the toes, not the ball of the foot. The natural alignment of the human foot is where the metatarsals directly align with phalanges (toes) and get wider than the ball of the foot. When I look at what is an ideal shoe I base it on what is ideal to complement natural foot function. Let’s assume that the foot is designed to work on its own without the need of modern bracing, cushioning, and motion control technology. One may deviate some from this to compensate for a specific structure or strength issue. The goal is progressive rehabilitation toward the ideal and getting the walker or runner in the least amount of shoe that is safe for them while they work on the functional corrections. To me this is the definition of minimalism. Level Heel to Toe (zero-drop) and close to the ground. Our arches are designed to be supported at the ends, and that means heel, ball, and toes in level and balanced contact. This facilitates stability and balance in mid–stance. 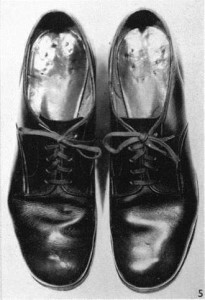 A shoe should not have “toe –spring” either (picture). 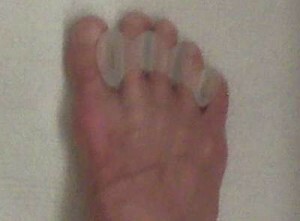 This places toes in extension and contributes to extension deformities (hammer toes). Level shoes also complement a proper posture. Wide Toe Box. When the big toe is compressed to be out of alignment, the front end of the arch does not work. The big toe is crtical in balance, stability, and propulsion. Picture: Toe box too narrow. Note deviation of great toe. When a load is applied to a foot by running or with a pack weight your foot will spread in length by up to half an inch. You need at least an 1/8 inch or more space on heel and toe for any sock. Your foot will splay 15% in width under load if allowed in the shoe. Your foot is widest at the toes and unfortunately most shoes are not shaped this way. Note…We’ve never had a customer return and say their shoes were too big. Do not assume you are the same size as a previous shoe. Take your time and try several shoes on, preferably at the end of the day. Go run in them. Do not try them on sitting. Always try both shoes on. If feet are slightly different size fit the larger foot. Take the shoe removable insole out and see how your foot fits against the insole as a template. Is there room at the toes or does your foot spill over the insole? If no room to spare or if your foot spills over, this shoe will not fit comfortably. Keep going half size up until the shoes are obviously too big. Try on shoes at end of day when feet are most flattened and swollen. Try on with the type of sock you will wear for activity. For women, you may fit better in a men’s shoe for width at the forefoot. Do not lace the shoes up tight. Allow spread in the midfoot and forefoot. Go up onto the ball of the foot. Can you put your index finger between your heel and the back of the shoe- if not the shoe is likely too small. 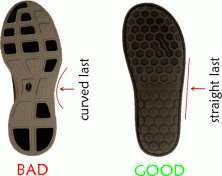 Consider not using the soft insole. This takes up space in the shoe and interferes with ground feel. Walk on a firm surface, not a carpeted one. If you are a runner you MUST run in the shoe. What feels nice and soft when walking is the opposite of what you need when running, which is a more firm base to give the message up your kinetic chain to stabilize/balance in mid stance. Sandals are great as they allow for natural foot spread without restriction from an upper. When trying on shoes, wear the socks you would normally wear in them. Socks are not necessary but are mainly for added comfort, especially in avoiding blisters. Like shoes, socks can be too tight, contributing to foot irritation and restriction. For most situations, socks should be thin and not tight. Make sure your socks do not bunch. Thicker winter socks may require a half-size larger shoe. Which style of socks you wear (low-cut or above the ankle) and what they’re made of (natural fibers such as wool or cotton, or a blend of synthetics) is up to you. But like shoes, make sure they fit well; and be careful to avoid the sock interfering with shoe fit. My preference is merino wool or light synthetic blend. In the past 3 years I have completely rethought how a shoe should fit, or more accurately I now think about how a shoe should fit rather than just pick a size. Since I started running more true barefoot miles over the last 2 years my foot size has greatly increased in thickness. I can no longer wear any shoe that I owned 2 years ago. To accommodate width, my shoe size has increased from 11.5 to 12.5or 13. I have recycled an entire closet of older work shoes which do not fit and have a heel. It is nice to restart fresh and happy. We have many customers come in who do not pass any of the functional tests described in Strenght and Mobility. They have a structural, strength, or mobility issue that does not allow the ideal foot function. We give them specific corrections with exercises they can do all day. If they have the hallux valgus deformity we use Correct Toes. Metatarsal pads are useful for toes held high in extension (hammertoes) as the client works on getting toes down on the floor through the Toe-Yoga exercises. Does this mean they cannot get into a “minimalist” shoe, absolutely not. Walking and running are two different activities with very different forces. Running has 2.5 times your body weight 1200 steps a mile while balanced on one foot. Walking involves at most 1.1 times your body weight balanced on both feet. This is why it is rare to see a “walking injury”. The foot is more easily rehabbed with walking and standing. If a runner is strong in single leg stance, have anatomically correct feet, nice flexible heel cords, a good gait already; they are ready to roll pretty quick and do not need much “transition”. They feel great immediately. A young runner needs to transition into modern running shoes in my opinion. This sounds unconventional but imagine the kid playing soccer in flat/flexible shoes or the Kenyan runner being given a pair of running shoes. Do we suggest them to take it slow in these or you may get hurt? Maybe we should and maybe this is why so many high school runners get hurt now as we read stories of runners of years gone by and wonder how they ran without injury. The opposite is true for someone who fails all these parameters. They need lots of supplemental work and to need to get in proper shoe all day. Be “barefoot” all day. So for walking and standing, which most of us do more than running, get in a thin and most flexible shoe to aid in foot retraining. For the running activity one might still need some assistance in controlling the foot as they progress, so a more protective shoe that still has the 4 key features(above) is ideal. Remember you goal is fun, play, discovery . Running Times piece by Brian Metzler. NY Times Summaries of the literature with permission: Phys Ed: Do Certain Types of Sneakers Prevent Injuries?